The latest retail and entertainment complex in Silesia will enrich its fashion offer. At the beginning of January, the Polish brand Tatuum opened its store on the ground floor. The store will occupy 145 sqm and will be located next to stores such as Mohito, Tommy Jeans & Calvin Klein Jeans, Guess and Orsay. Tatuum is a fashion brand for women and men, combining timeless classical designs with the latest trends. This year, the Polish brand that designs and sews clothes will celebrate the 20th anniversary of its presence on the market. Currently, Tatuum has several dozen stores in Poland and stores in Europe. “Tatuum is a very interesting addition to the list of fashion tenants gathering clothing chains of well-known brands present in Libero. Two months after the opening, we can say that our clients appreciate the completeness of the offer prepared so that everyone, regardless of the size of wallet or age, will find something fashionable in Libero” says Michał Banasik, Senior Leasing Manager from Echo Investment’s Retail Department. In Katowice, ​​45,000 sqm Libero gathers more than 150 stores and service outlets. The complex offers both premium clothing brands, including: Guess, Tommy Hilfiger and Calvin Klein, as well as well-known chain stores, including: Reserved, H&M, Terranova, Carry, New Yorker, Diverse, Medicine , Monnari, Orsay, Quiosque, Greenpoint, Sinsay or Mohito. At the intersection of Kościuszki and Kolejowa streets, residents of Katowice can also shop in a store of Royal Collection offering collections of prestigious brands: Hugo Boss, Versace Collection, Tadashi, Oscar Jacobson and many others. An interesting fact in Libero is also one of the first brick and mortar stores of eobuwie.pl in Poland, where you will not find traditional shelves with shoes. There are screens displaying special offers and several stations equipped tablets on which - just like in an online store – you can choose a model and size of your shoes. After placing the order in a few minutes they are delivered to be tried on. In the store you can also carry out orders placed online. 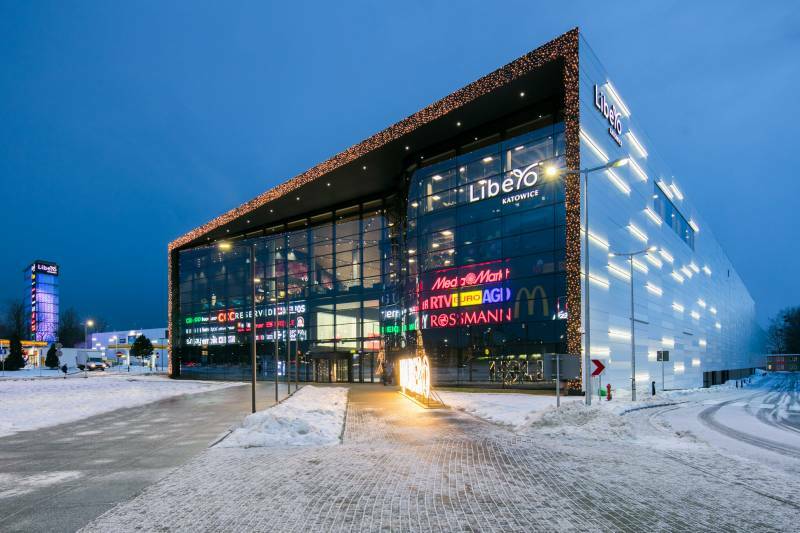 In addition to shopping, Libero also invites you to one of the most modern cinemas in Poland, which was launched by Helios at Kosciuszki 229. The multiplex has 8 comfortable screening rooms equipped with high-class cinematographic equipment. Two of them are Helios Dream rooms, distinguished by modern interior design and comfortable, leather seats with adjustable seats. In Helios, apart from films from its standard programme, a wide range of special projects wait for viewers, dedicated to women, children or film fans. The investor and developer of the complex emphasises that 20 percent of the space is entertainment and gastronomy. In Libero, the entire second floor has been dedicated to it, in addition to the cinema: MK Bowling entertainment centre with a 10-lane bowling alley and a billiard club, a modern two-level fitness club belonging to Fabryka Formy, a children's entertainment centre KOKO Planeta Łobuziaków, also 13 restaurants and cafes, and in the middle of them Pizza Hut, the Mexican restaurant Papa Diego or sports restaurant Food & Ball by Arek Milik. The space is open to the residents of Katowice also on Sundays free of trade.